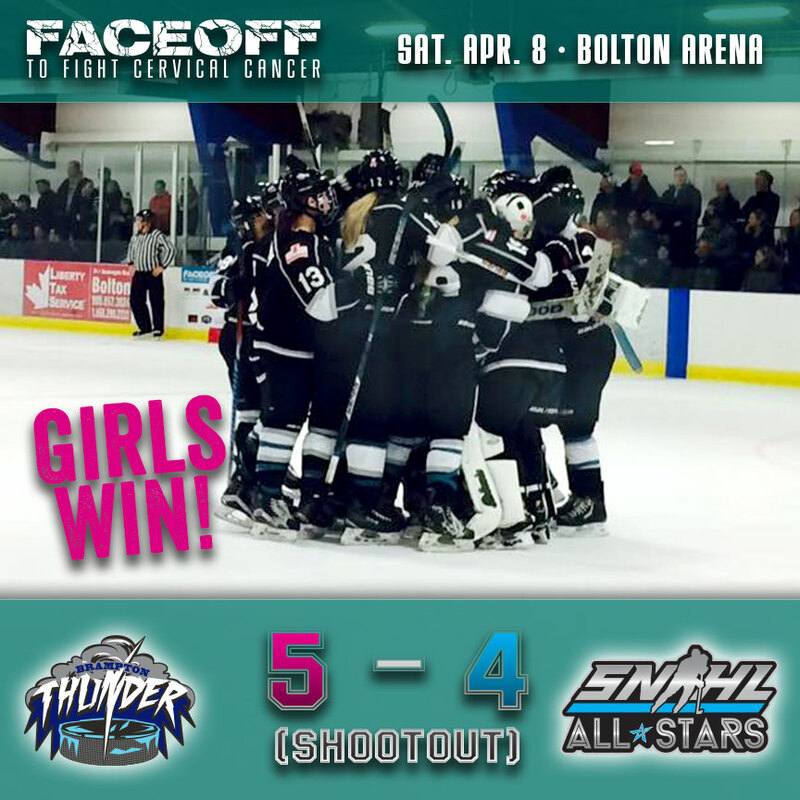 In a tough match, the girls from the Brampton Thunder were back to exact revenge on the SNHL All Stars. Last year the All Stars were able to better the Thunder, and this year it looked like it might happen again, as the All Stars jumped out to an early lead. Potting a pair before the 1st frame was half over were Brent Spagnol & Dan Maggio, with assists from Marc de Abaitua & Maggio. Around the 6 minute remaining mark the All Stars struck again this time by de Abaitua(unassisted), then 2 minutes later Brett Appio put one home past Thunder goaltender Jamie Miller to give the All Stars a 4-0 lead. Not to be out done the Thunder girls were able to halve the lead in the late stages of the first. The crowd erupted when Bolton’s own Rebecca Vint put one past All Star’s Grant MacEwan to get the Thunder on the board. The cheers continued as Karolina Urban scored their second on a pass from Liz Knox. The second half saw the Thunder tie it up, with Chelsea Purcell scoring from Urban & Vint, followed by Sarah Edney from Vint & Jamie Lee Rattray. As regulation time ended, the game was headed for a shootout. After both teams missed their first chances to get on the board, Nicole Brown scored in round 2 for the Thunder to put them up 1-0. As the All Stars missed their 2nd attempt on Miller, Rebecca Vint was given a chance to end the game. And she didn’t disappoint her hometown crowed, going 5-hole to deke All Star’s goalie Brett Weight and score the win for the girls, while earning her the We Are Creative Player Of The Game award for the girls. Marc de Abaitua was selected as the We Are Creative Player Of The Game for the guys. Off the ice, it was just as exciting as the fans enjoyed a Prize Raffle and Silent Auction, and the players celebrated with a Season End Party. 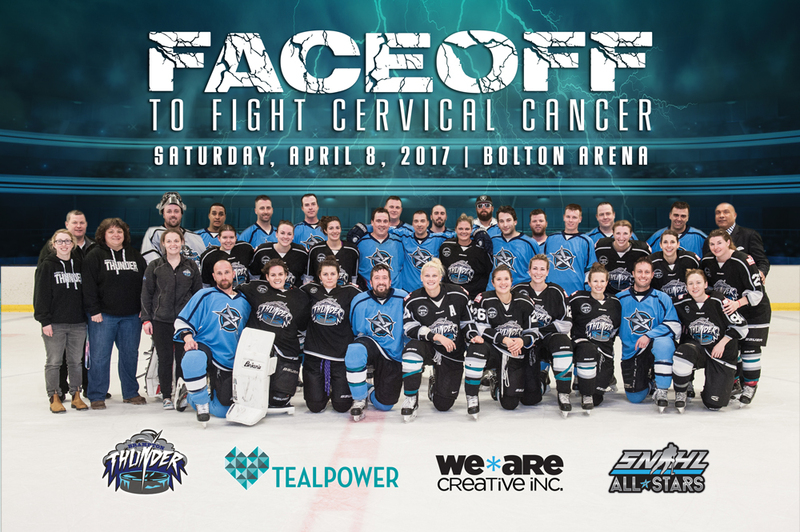 In the end, the 2017 FACEOFF event raised $9000 in support of TEALPOWER.ca. The donation is being made in memory of our friend, Ange Chester. Missed the event? Check out our feature from Rogers TV Sports Zone!